Flag of the Republic of Macedonia was established on October 5, 1995, by adopting the Law on the flag of the Republic of Macedonia (Official Gazette of the Republic. Macedonia No. 47/95 from October 6, 1995). Former flag was repalced in accordance with the Interim Agreement, signed with Greece, with which Macedonia has agreed not to use the symbol of the 16 ray sun of Kutlesh (Star of Vergina). Flag of the Republic of Macedonia is red with golden-yellow sun. Sun is with eight solar rays that extend from the solar disc extending to the edges of the flag. Sun’s rays intersect at diagonal, horizontal and vertical. The diameter of the solar disk is one-seventh of the length of the flag. The center of the sun coincides with the point at which the diagonals intersect the flag. The ratio of width and length of the flag is one to two. The graphic design of the flag of the Republic of Macedonia is an integral part of this law. Authorship is attributed to Miroslav Grcev, who was invited to prepare a study for the new flag. However, the flag which has been voted deviates from Grcev’s proposal, made at the last moment. The original 10:16 was replaced by 1:2, and around the sun a red circle was added, detaching the rays from the solar disk. Grcev believes that these two interventions violate the principles upon which his original project, and it entire concept lays upon. More about the process of crafting a proposal for Flag of the Republic of Macedonia in Macedonian Herald No. 5. Flag of the People’s Republic of Macedonia is used in the People’s Liberation War (1943-1945) as a voided yellow star in the middle of red cloth. Often, the rays of the star are rounded. The first constitution of the People’s Republic of Macedonia of December 31, 1946, for the first time establishes the flag of the People’s Republic of Macedonia. State flag of the People’s Republic of Macedonia is red five pointed star. The star is red with gold / yellow / edge and has a proper star shape. The ratio of width and length of the flag is one to two. This Article does not expressly determine the position of the star, but practice shows that it sets in Canton. The Constitution of 25 February 1974 (Official Gazette 7/74) fixes this disadvantage. Flag of the Socialist Republic of Macedonia is red with a five pointed star. The star is red with gold (yellow) edge and has the correct star shape. The ratio of width and length of the flag is one to two. When the flag divided into four rectangles, then the midpoint of the star coincides with the point at which the meeting point of the diagonals of the upper rectangle the flag that is fixed. The upper ray of the star is directed towards the upper line of the length of the flag and lower rays are directed towards the lower line the length of the flag. The Radius of the star is equal to one sixth of the width of the flag. The first flag of the Republic of Macedonia, with the golden arm 16 rey Sun (Star of Vergina) is еestablished by adopting the Law on flag on July 11, 1992. (Official Gazette of the Republic of Macedonia, 50/92). This flag was used in the Macedonian diaspora from the late 8O’s of the last century. It is based on symbols from the sarcophagus of, what is assumed, King Philip of Macedon. Sarcophagus and tomb were it was found was discovered in 1977 by Manolis Andronikos. The proposal is of MP Todor Petrov, and technical drawing of Miroslav Grcev. 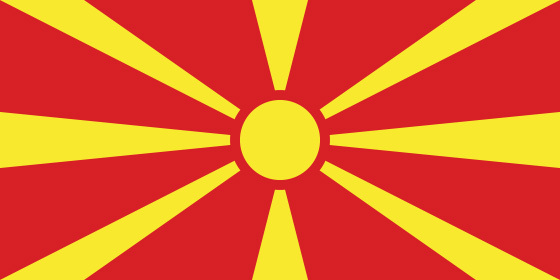 Flag of the Republic of Macedonia is red with a golden sun. Sun has eight primary and eight secondary rays, slightly entered in the first half, alternately and symmetrically arranged around the solar disk. Basic sun rays are directly detached from the solar disk, and the final external length of all sixteen rays coincides with the outer periphery of the sun. The diameter of the solar disk is one-seventh of the width of the flag. The ratio of the diameter of the solar disk and the length of the basic solar beam is one in two, and the ratio of the length of the side and main solar beam is seven against eight. The center of the sun coincides with the point at which the diagonals intersect the flag. The ratio of width and length of the flag is one to two. In 2013, the flag of the Republic of Macedonia got а website. The website is an independent personal project of Kosta Stamatovski. On it, in addition to information on the flag, files with the flag can be downloaded. The website has its own Facebook page where, among other things, Facebook events are created for the regular ceremonial changes of the flag in front of the Assembly and the Government of the Republic of Macedonia, and photos of the ceremonies are shared.